Engineering graduates dominate the top ten list of highest-paid degree holders. But that’s not the whole story. 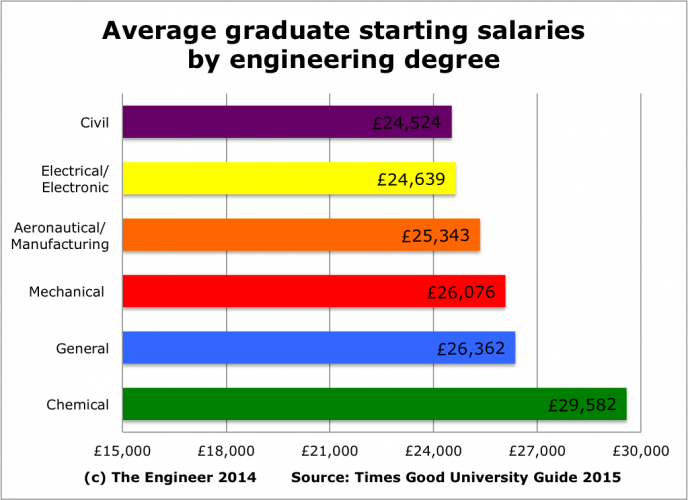 I try to maintain a degree of scepticism whenever I’m told engineering graduates are high earners. Firstly because so many engineers will tell you that they’re underpaid. And secondly because the figures used to claim salaries are high are usually broken down by the subject studied at university not the actual job being done. Figures released this week by the Times Good University Guide fall into this category. They show that six of the top ten highest earning subjects based on starting salaries are engineering disciplines. Chemical engineering graduates earning on average more than anyone except dentists, with a mean starting salary of £29,582. This was followed by general engineering, mechanical, aeronautical and manufacturing, electrical and electronic, with civil coming bottom of the pile (but still better off than almost all non-engineering subjects). However, these figures suffer the same limitations as many that have come before them. Simply put, engineering graduates may be among the highest earners but that doesn’t mean engineers necessarily are. We know that only around 70 per cent of those who study engineering go on to work for a company whose primary activity is engineering (according to the Higher Education Statistics Authority). That could mean that many graduates go into higher earning sectors but also that others work for engineering firms in non-engineering roles such as business, management or even sales. And mean figures like those in the Times guide can be skewed by a small number of very high earners. But, also released this week was another figures that counter this argument. The annual What do graduates do? report from the Higher Education Careers Service Unit (HESCU) found that average salaries for engineering graduates tend to be above those for other subjects because of the larger proportion of graduates working in full-time engineering roles. Among mechanical engineering graduates, for example, 64.2 per cent surveyed were working as engineering professionals (not just in engineering companies) and only 22.9 per cent were in other professional roles, with just 8.4 per cent in business, finance or management compared with 13.2 per cent for all graduates. This follows what we know about the proportion of engineering graduates who actually swallow the blue pill and enter the financial services industry: it’s just 2-3 per cent – half the graduate average. There are of course those who will view the average starting salary of a mechanical engineering graduate of £26,076 as low, or at least not relatively high. After all, it’s about the same as the median salary for the entire workforce – and far less than £40,000-plus offered to some graduates in finance. But part of the problem here is that our view of professional salaries is massively skewed by the very small number of people (less than 1 per cent of earners) in finance and management who receive more than £100,000 a year, or even the 5 per cent who earn more than £50,000 a year (which includes many engineers). Large companies in the City may typically offer a small number of graduates much more than £26,000, but the average graduate starting salary according to HESCU is just £18,615-£22,785 – significantly less than the average received by those who study engineering. And while it’s commonly believed that the other professions typically pay far more handsomely than engineering in general, a look at the figures suggests that for most individuals this isn’t true. According to the Office for National Statistics’ Annual Survey of Hours and Earnings, the median salary of an engineer is £38,428 whereas for solicitors it’s £38,271 and for chartered accountants it’s £34,745. Even architects, who typically train for twice as long as engineers and probably receive twice as much prestige, receive a median salary of just £35,000. What none of this answers, of course, is the question of whether the salaries received by engineers reflect their level of training, the demand for their expertise and the social value of their work. Engineers and solicitors may earn the same on average, but you don’t hear regular complaints that there’s a shortage of lawyers. Should we leave fossil fuels in the ground to limit climate change? Nice to see the old bubble of lies pricked a little, but I expect the unfounded bleating to continue. Aside from being one of the most interesting things one can do as a career, Engineering does pay well. Even a moderately successful, adequately qualified Engineer with a little determination can earn more than a current MP’s salary. Any chance of some proof to these claims? The fundamentals of capitalism which allow those few who earn outrageous amounts of money is funded by the fact their workers earn undesirable salaries and this article outlines this problem quite nicely whereby it shows how underpaid the engineering profession is. Sorry but that’s only if you manage to go contracting and even that’s falling due to recruitment agencies and mass immigration pushing wages down ( half the people i find contracting now i cant pronounce their names or understand them and it takes 10 times longer to get the information across!) and filling roles with useless candidates! companies are run by pen pushers who don’t care about supplying quality and as long as they can offset and make the books look OK (in reality there not due to the false economy of having to redo the shoddy work) I’m constantly having to settle for well bellow what i was on 5/10 years ago for roles of a senior level. my father was on a lot more than me decades ago and i earn more than most doing the same job. as some have pointed out above there is this shift i am getting interview by uni only engineers, who have no knowledge of real world engineering, in fact they have no knowledge of engineering, I know this as I did my engineering degree latter on in my life, and it was basically useless, it offered me very little in anything useful except ticking a box for jobs wanting a degree. I have worked with people with PhD’s and found them to be useless, no common sense. also in respect I have worked with people off the tools and also found them to be equally useless due to the disregard to the engineering process. This is complete rubbish! Compared with Medical, Law and Finance Engineering pay is well below par. You will also find that the three aforementioned fields have a much better defined career development and training path. The truth is that funding for engineering training has been neglected for decades. The pay is sub-standard and the pensions are poor. If you are clever enough to do engineering then I advise you to consider a profession that gives you better rewards and public esteem. Don’t be a mug! You need to move jobs. I have 5 years experience and on 50% more than that. I didn’t do a grad programme, and only got a 2.2. In West Midlands too so no London weighting. As a moderately successful and more than adequately qualified engineer working for a FTSE 100 hi-tech engineering firm I can confirm that I do NOT earn anything like an MPs salary. So the ‘bubble’ is certainly not deflated. Facts are facts an MP earns £66k, compare this with the figures in this article of £38k for an engineer and you can clearly see a huge disparity. CORRECTION An MP does not earn £66k , he gets PAID £66k and picks up another £100k in expenses and gets a fat pension too. My apologies, I see MPs have given themselves a 10% payrise therefore their new salary will be £74k so the assertion that Engineers are paid a similar or greater amount is even less true than I had thought. Engineers receive the market rate, that is clear. That the ‘market’ does not reflect ‘value’ is also clear; it reflects a version of supply and demand. If Qualified, competent Engineers are receiving better remuneration then it is partly because they add value but also because, today, they are required by regulation. I cannot get insurance for an implemented design unless it is signed off by a competent person – frequently a Qualified Engineer. As business slices and dices skills and careers (talk to Drs & Lawyers) this will change. In the future Engineering may still probably be more fun than the legal profession appears to be but will be different and probably, on average, paid less. Perhaps one of the more important reasons for an engineering/science/nedical degree is that its a degree that actually has some value. It shows the ability to learn and work hard to obtain a degree unlike those in (dare I say it) the humanities whose hardest part of the course is getting out of bed before 10am! I wouldn’t consider £30,000 per month as high pay. Take home pay is about £1950 per month, which is about double minimum wage. Deduct from that £450 for renting a small home, plus £100 council tax and £150 fixed costs (insurance, tax and mot) for the car. With a really frugal lifestyle you spend another £10 per day and person for groceries. Remove about £50-100 for utilities like gas, water, TV, electricity, phone. Which leaves you about £850 to save for a car, proper clothing, a wedding, a house, maybe a holiday, and a family. The first 10 months savings will be used to get a cheap car for £8500. Another month’ saving for a bicycle. Add a partner and you are down to £500 savings per month. With a few restaurant visits and maybe cinema or theatre forget any savings. To get one new tooth implanted (~£3,000) you need ~3-4 months savings. You still have a few years to go until you lose your first tooth, let’s say for the next 32 years you save for one tooth replacement each, which means every year 3 months savings go into one tooth (not counting any inflation). The same goes for laser treatment for eyes. And any other needs not covered by NHS. Now that you have covered yourself, let’s talk about a carehome for your parents, schooling for your children, and possible some education for yourself to keep up to date with developments in science and technology. Cmon, What about the £27K you stashed away!! When I first arrived at University the head of the department made a simple statement “If you want to be rich you have chosen the wrong profession”. He was right! 20k for a graduate is good. I’m with “cynical old engineer”. Many of the reports of engineers on the poverty line are wrong. So well done The Engineer for throwing some facts into the story. Anyone who thinks the numbers are wrong should come up with their own. Anecdotes about better-paid burger flippers carry little weight. If you really want to see dreadful salaries, look at the journalists who write this stuff. That really is a case of doing it for love rather than money. Harrumph. The comments here about engineers being paid a lot are mistaken. So anyone wants to tell me that an en experienced engineer with about 11 to 12 years experience being offered £40,000 per annum is well paid? Compare the same level of experienced professionals as Lawyers and Doctors with the same level of experience. You have to realistically be out of your mind to think that an experienced engineer today being required for remunerations for £40,000 or less is well paid. Either you are out of your mind, or you have a special vendetta against engineers for some reason to bleat such baseless inaccuracies. I forgive your time of writing your comments but at £40,000 per annum with steady rise in cost of living, it is actually a joke, for posterity’s sake, that engineers in the UK are being mocked for real. Never ever you say again that engineers are well paid because they are not. In order to compensate for this deficiency and embarrassment, engineers are now forfeiting the key areas of the profession in droves and going into project management or managerial roles – almost completely ostracizing themselves from the profession and it’s decision making tools and processes. It is common to hear a qualified engineer who has taken on the role of a project manager or some managerial role say “well I’m not an engineer”. And why not? It’s a damned low paid profession and the most mocked of all the other contemporary professions. Then where are all these high paid jobs, apparently there is a shortage of engineers so why are so many out of work if there is such a demand. Take a mechanical Project Manager: numerous skills required such as a broad engineering skill, administration skill, legal skills and often contract negotiating skills. Add this up and this position/s is possibly the most diverse range of skills required so where are there any jobs generally earning £45K + per annum. They add substantial value, reduce deficits if there are any, bring a considerable engineering capability to a company and a diverse range of problem solving skills, along with the ability to negotiate at all levels. The way to progress salary in engineering is to take on management responsibilities. This route will get you more money but you will cease to be an engineer other than through the people you manage. If you took out the people that hadn’t progressed to be managers then I’m afraid the salary is very poor and typically only a few thousand more than a graduate gets. I do also question the graduate salary survey as these are typical salaries at large corporates, smaller firms don’t tend to pay anything like this for grads, but that may have changed. Its not just about the starting salary its about the progression and opportunities, I started on £25k with an engineering firm, I’m now well above that after 5 years having moved companies. But when compared to other grads who have started in other fields I’m well behind as their companies have rewarded better over the years. There is a shortage of engineers – who are happy with little pay. And add a few unpaid overtime hours per day. What many people forget is that pay should cover cost of living without the taxpayer having to add to that. Pay for work shall come completely from employers, and therefore customers. Companies, like big banks, who need tax money to survive should go bankrupt. The money owned to account holders should be confiscated from the wealth of bank managers and shareholders who have fleeced the bank. The smallest accounts to be paid first. But that’s another story. Firstly, do you live on earth Ralf? I dont know where you got some of those figures but at least it gave me a laugh on a Monday morning. On a more serious note and based purely on personal experience; I honestly think that engineering graduates are paid too much. As an example of how I have formed this opinion I will use our (the company I work for) latest recruit. Straight out of university with a degree in engineering design, starting wage of 2k less than myself. I have been training him only to find that there are some very basic things he knows nothing of. Off the top of my head and this list is not exhaustive, these are some of them: Geometric tollerancing, surface finishing, material selection and these are the best ones…..He didnt know what box section was or what a tapped hole was!! I actually asked to see his degree and sure enough he does really have one. How on earth can individuals such as these (I have witnessed many) justify twice minimum wage? Your problem with your graduate is that there is so much to learn that some basics have to be dropped and can be picked up easily once in a post as much taught may not relate to the job one actually finds after graduating. Generally we get to know more and more about less and less. Back in the 1950s few electrical engineers knew much about software and in the transition to digital, the old school of the time knew loads about valves but nothing about transistors. My advice is don’t be so swift to judge. I think your company probably need to look at its hiring criteria / interview process as opposed to slating all graduates. Im a recent graduate trying to weather the oil and gas downturn and have plenty of stories of friends who just cant see the point in continuing in different industries for very little advancement and recognition, so have flown the nest to travel or pursue other things. With MacDonalds store managers earning 32k per year, 4 years of university and arguably the hardest degree you can do should put you in a better position than that!!! The trouble with trying to analyse the salaries of engineers is that the subject is far too vast to be covered in a few statistics. It’s like saying ALL footballers are over paid. Do you mean Premiership? Or small local town clubs? There’s a huge difference between them. It’s the same with engineering. Salaries in the Oil & Gas sector are generally 3 or 4 times the national average (I personally know several guys at other Oil companies on around £150k). Whereas some of the smaller or sub-contract companies may pay around £50k. Other sectors may be around the £30k mark. I guess it’s all down to supply & demand. Ralf. For someone with your tenuous connection with reality and total disconnect from economics, Red Ed’s roadshow was LAST week. Who is this mythical being you describe? (4) generally hides behind their computer putting together Gantt charts that mean nothing. (5) when they emerge from behind their computer, they then proceed to try and hold projects hostage to their lack of understanding. In my experience, jobs big and small would be better run by chief engineers and technical leads – people that understand getting solid foundations in place then making solid steps off that is more important than turning little boxes green to meet schedule. Project “managers” would then be restricted to the role of administrative functionaries where they might actually be useful instead of doing damage. In my experience, professional project managers are a lot like professional politicians: limited qualifications for their role and a belief that because of their title they know everything. The best project managers are those that have come up through the ranks and have an interest in and can actually do the job that they are managing. A big problem with engineering pay is that to achieve decent pay rises you have to change jobs regularly, there is no recognition or reward for loyalty or just being able to do a decent job. My own personal rule of thumb is that you should be paid equivalent to your age times a thousand. Brendan, I fear you haven’t met a good Project Manager. Done well, with Engineering experience to back it up, I personally believe that Project Management is the more demanding job. That’s one reason, apart from the orgiastic fun of a good explosion, for example, that keeps me as an Engineer. Up to a certain size, jobs are often, as you say, best run by a Chief Engineer, and many of my own best projects have been ones I’ve run, Engineered and PM’d. However, above a certain size, I think it becomes impossible to do both. However again, there are too many PMs about now, partyl to try to let us make best use of the fewer good experienced engineers we have. On the other hand, what the hell is a degree in Project Management for ? Yes, I realize that £450 for a small terraced house is quite cheap for England. Small enough that there is no wall where to put a sofa or cabinet because there is either a door, a window, another door, yet another door or an open fire hole in the way. And I also realize that it is considered normal by many that people should be paid benefits if their salary is not sufficient to cover their cost of living. I don’t know what a tapped hole is either. Probably something mechanical. Students should learn how to learn and gain knowledge. If your company is up-to-date you probably have a quality manual and training material where all the terms you need are explained. Just a thought – if customers do not have enough money, how are they supposed to buy goods and services or service loans and mortgages? Remember 2007, when the oil price hiked and loans defaulted? When credit card companies cancelled cards of those who always paid back their credits and issued more cards to those who only paid minimum amount and racked up more debts? Economic reality. But does it make sense? Even if Warren Buffett earns a million times minimum wage, he still won’t buy a million times more breads. That money on him is totally wasted. And no matter how much you defend that, you will never get into that region yourself. I would not dispute that engineering graduates are paid well, but experienced engineers are a whole different ball game. It appears to me that whilst the starting salary is good, 10-15yrs down the line its not so good. The reason for this is likely the availability of engineers from places like China and India who were happy to come work for lower salaries. The problem now is the salary for engineers in places like India and China is increasing and less and less engineers want to come to the UK, which will once again lead to us struggling to find any engineers. I like to think that this would lead to higher salaries for engineers in the future, however being a realist I see it leading to more engineering companies moving manufacturing and deign abroad. In my experience in Nuclear you cannot just take engineers from india and china as they will not pass security clearances to work in UK Nuclear projects. I am told that you get paid in accordance with your level of responsibility. As a Design Engineer, I can’t think of a more responsible position than the creator of the products and services which are sold to generate revenue to pay the inflated salaries of those who bring little to the party. Why don’t Engineers’ salaries reflect this level of responsibility? John Harrison – I couldn’t agree more. Grumpy Old Engineer – do you really think that a prject manager in engineering is a more dempnding job than an engineer? In the automotive world the project manager just produces pretty coloured traffic light charts to show the progress of the project. They might chase you as to why things are late but they don’t listen to your explanation. they have NO control over the project as this has been pre-determined by a higher authority within the organisation. I suspect there aren’t many project managers that actually create proejct plans, analyse how long each task takes, number of people cost etc. In the auto industry the time it takes to do a certain type of car, be it a brand new design or model year update, is pre-determined by a programme management tool. The project managers just chase this. I’m sure there are some proper project managers who really do have a more stressful job but not where I work. I also agree with someones comments that the only way for an engineer to get a better salary, whilst staying in the UK, is to move in to porject management. Sad reality really. £30K is not high pay. maintenanceTeam leaders are usually on 36/37K. If you are doing shifts the average pay is £45-50K. As a basic technician! Engineers are still paid rubbish and are considered as dirt on the bottom of ‘managements’ shoes. My weekly hours are 55+ and I still have to come and sort out major problems at weekends if required. I cannot reccomend a career in engineering to anyone currently. All my sons have fortunately chosen other career paths. Until you stop plumbers and gas fitters from being called ‘Engineers’ and give the correct status and pay as other professionals that wont change. The only way for an engineer to earn a good salary in the UK is by not engineering anything, Management is the only path to a decent salary and whether its management of people or projects then it really translates into nothing more than management of money. The more money you manage the more you earn. Cynically its not what should define the pinnacle of an engineering career. That said, having lived away from the UK for 6 years its quite shocking to note (from afar) that engineering and management salaries (related to engineering) are less than they were 6 years ago. Internationally, engineers are better paid and respected than they are in the UK. That is the theory but reality is a bit different. Obviously depends the Industry category which classified you as engineer on the different pay level. On the another way it’s unfair from my point of view calling to gas fitters and plumbers as engineers to classified them to the same level as for example chartered engineer (4 or 5 years engineering university) that’s is big difference for me with respect to any professionals. My salary as an experienced Professional Chartered Engineer, working in the private sector for over 30 years, has actually lost value at the rate of about 1.4% per annum relative to the cost of living for the past 15 years, whilst graduate starting salaries have flat lined or barely kept up with the RPI. even so the gap between recent graduates and time served professionals has become very narrow. Exactly as you wrote, “any Project Manager YOU HAVE MET”. This does not allow you to generalize to all Project Managers. There are serious and highly skilled individuals out there who hold “solid engineering foundations” as well as all other skills listed by S Martin. You had no chance to meet them in your career and this does not mean they do not exist. I missed the privilege to see the McLaren 650 to date. If I follow your logic I am entitle to say that fabulous car is a “mythical” one too. I’m 45 with an electrical engineering degree, employed in the field and only earn £25k. I travel 3-5 hours a day to get to work and 1/3 of my net pay (not including cost of a car) goes in travel expenses. I was out of work for 5! YEARS previously. At oe interview, when it came to negotiating wages, the MD lughed when I said how much I previously earned and offerred £17.5K. Now say engineers aren’t underpayed. At the top some categories of engineer are very well paid, and in very secure jobs, far more so than many lawyers, for example. Oil & gas engineers, railway signalling engineers, mining engineers, marine salvage engineers, can often earn £90-150,000 a year, albeit sometimes working in rough locations, and often in tax-free countries. If I could add up I’d have been an engineer! It is no wonder you UK Engineers are in the US. Thatcher has screwed you. The same Globalization forces are sucking out the middle class like a giant vampire squid. New Grad salary is about 50k $ here. We are moving to a 2 class society. If I could do it over I would not be an Engineer just due to the sorry profession it has become. You can hire a smart Mexican Engineer for $5/hr. Engineers have worked themselves out of a job. Don’t do it – that’s my advice to anyone thinking about a job in engineering. It’s mostly boring and you’ll regret every moment as you watch your Uni mates in the city discuss the problems their having with their Lotus or Porsche. Unfortunately we live in a gloabalized world. Your skill sets are becoming commoditised. Your profession is a cost centre function, whereas lawyers see themselves as revenue generating units. I guess in business you have to decide whether you want to be the head of the dog or the tail. It’s unfortunate – because I believe higher value should be derived from the tangible realisation of idea, whereas business places greater value on the time the lawyer spends drafting a contract. We need to commoditise, the lawyer’s skill sets through technology, if we ever want a shot of levelling the playing field, with respect to salary parity. Wow! I cannot believe how atrocious the salaries are for Engineering Professionals in the UK. When I say Engineer, I mean a Design Engineer. Someone who creates, analyzes, and produces a product through the use of a theoretically based skillset. Not a technician who just applies engineering principles. I have been working as a Structural Engineer for 4 years designing bridges for a small consulting design firm and I make $110,000… and that doesn’t even include the really good benefits I get. But I work 12 hour days and many times on the weekends. I pull lots of all-nighters, my job is very stressful and extremely demanding, I study almost every night to advance my own understanding of the field, on the weekdays I only get to see my children’s faces after they are already asleep, I had to teach myself how to run high order non-linear seismic analysis of bridges, and I put in over 400 hours to study in order to pass a 16 hour structural engineering exam. This career should not even be mentioned in the same sentence as minimum wage. That is egregious! Sadly, I do know that many engineers do get taken advantage of because they basically don’t know any different and when it’s easy to replace you in your job, that’s when you find that your pay is low. One more point: It doesn’t help that in the UK, any repair technician, janitor, or plumber is also referred to as an engineer. That really lessens the intense university degrees needed to be a real professional engineer. Absolute rubbish. Any bank will offer a starting salary of 40,000+ depending on what business area you’re in, and by the age of 30 you can be in the 100,000+ band. At the electrical firm I work at practically none of the so-called engineers have a degree not even the chief engineer who only has an HNC. To my knowledge the only engineer graduates are the engineering director and me stuck in Tendering on thruppence a year. Even my boss only has a C&G. What they do all have however is around 30 years experience a piece whereas I’ve only 8 (plus education years which don’t count). My wages are amongst the lowest in the company yet I’m one of only two who is actually an engineer. Two conclusions: 1 No one should be legally allowed to call themselves an engineer if they aren’t qualifued as one: I can’t go around calling myself a doctor for example and2: in the UK at least if you want to be a well paid ‘engineer’ do not bother with the absolute con of graduate education. Get yourself on an apprenticeship and earning on the ladder from the off. If you stick with it you’ll have your C&G or HNC, be called an engineer and will be on practically the same amount I earn. you don’t need a degree to be classed as an engineer. you should be professionally qualified i.e. CEng. This doesn’t require a degree as you can qualify by experience through the technical routes. Good engineers, with good degrees, and demonstrated experience and commitment can get reasonably well-paid jobs. There is also the chance to move around, become a manager, specialise into more scarce (i.e. ££) fields, or become entrepreneurial. More importantly, if you want a career applying scientific and logical skills to real-world products and technology, with the nth degree of sophistication and significance, then you will become an engineer (lawyers and medics can make equivalent arguments for their career choices). I don’t think the people who need to know confuse ‘technicians’ with ‘professional engineers’ , though I personally think that it is a good thing that, in general, engineering is something anyone can pursue without necessarily having a piece of paper (let’s face it, CEng is not exactly a rigorous examination). If the masses are confused about it, I’m not sure that makes as much difference as is often said. Finally, I think the comparison with banking is spurious – in general the ‘financial engineering’ of bankers has no comparison with the work of engineers. they are well paid because banks make more money than engineering companies, but they can lose their jobs pretty quickly as well, and watching TV recently, their esteem in the publics’ eyes has fallen quite a bit. What examination are you referring to for the CEng? is there an exam like there is in Germany, USA, Canada? Last time I looked you needed to achieve professional prerequisities and attend an interview just to be considered? Why don’t you look at glassdoor or indeed and compare salaries for engineers in the UK to other countries? Still not sure, compare the salary to India and China……oh they seem to be markedly the same…………hmm. What engineering are you referring to that anyone can persue? Is that a generalisation? That is the attitude that demeans the title for people who have worked to achieve it. Use that generalisation in the US or Canada, call yourself a professional engineer without the proper papers and I’ll visit you in prison. Built on the shoulders of giants, how does all this financial wizardry exist without engineering…………erm it doesn’t. A little respect wouldn’t go amiss, I’m sure I couldn’t do what you do but I’d at least show some decorum. Here are my clarifications – I am not doing anyone or anything down – I think it’s great when people progress and get qualifications and experience – but some of it is more real and valuable than others. Yes, in the UK (more or less) anyone can say they are an engineer, from plumbers, through to technicians, and so on. That being the case, I was making the point that it is good that to ‘engineer’ something is an activity that anyone can pursue, such as many people who would not be eligible for accreditation, such as students, technicians, or enthusiasts, without them necessarily having to present a certificate to prove they are in fact ‘engineers’. My point about banking was that in many people’s view ‘professional engineering’ work offers a lot more to society than ‘financial engineering’, and if it does pay better, it comes at higher risk. UK CEng is not a rigorous examination (in a general sense) of engineering-practise related competencies (such as those a lawyer or doctor might have to pass). CEng or the equivalent may well be a license to practice in other countries, but it isn’t in the UK. Perhaps it should be, and I don’t know why it isn’t. It does have significantly higher annual fees though. My beliefs about engineering salary levels are UK-only (i.e. between say chartered engineer, accountant, banker and so). I have no idea what differing salaries in other countries are like. With a degree in Electrical Engineering, and 24 years design experience in ship design, I am currently working in a warehouse on little more than minimum wage. I am repeatedly told that my previous design experience does not apply to non-marine engineering, so I am re-training. I could not recommend a career in Engineering from my own experience. Seniors at our firm earn no more than £35k and that includes car allowance. exactly 35K is diabolical, that was good pay 25 years ago for a office worker, not a senior engineer! we wonder why most of our engineers are going abroad for work! and just to curtail the likes of the Indian engineering uprising, I know of several companies who have contracted out engineering work, even drafting work to the likes of India and have monumentally regretted it, I used to have to check drawings coming in from them i would run out of red pens marking them up and in the end it took 10 times as long if i where to do it my self, wanted to hire the cleaner to do it instead of these guys would of been done better! But as i have said before companies are run by pen pushing accountants they see low wages and can hide away the time taken and quality as that’s not their problem! Good article, thought provoking. But the commments were same as my experience, engineers earn much less than in other, higher valued fields. Unfortunately civil is at the bottom of the pile. Hi all from my personal experience the salaries engineers are paid is no where near £30k. I have 15 years management experience and 3 years engineering experience and I can only find a role paying under £20k. When I did the research before returning to study there was an out cry for engineers but the work is not there. I was made redundant over Christmas and it took 6 months to find a role in the UK. A friend of mine is a teacher and he says how can he get his pupils interested in engineering when the salaries are lower if not even to working in Lidl on the checkout. So where ever this information has been obtained from seems to have been doctored in some way, because the reality is in the UK we work for next to nothing compared to people in EU. I love engineering that is why I stay in my current role. Really? UK salaries are Lower than the EU? I wouldn’t have expected that. Many friends worked in London on Crosstail for different consultancies and they said 27k-28k is possible for chartered engineers. Do numbers add up in this site below? I wonder because that seems quite low by my experience. The pay in the UK is SHOCKING for engineers taking into consideration the high cost of living; hand to mouth. I started my career at £18k as a graduate structural engineer. I got my salary up to an astonishing £21k after jumping to another job. Then the recesion hit and I found another job with the same pay. I then lost my job in the middle of the recesion and became self employed with a uni friend. Our first years turn over was around £20k our second was £90k (after righting off around £30k due to bad debts). I think the demand is there the problem is that engineers are not valued. The only way you can make good money is either go into oil and gas or play on companies despirations (when they need a quick turn around you charge a kings ransom). Otherwise you are looking at roughly 1.5 times your salary which is the brake even point to your employer, if an engineer was paid £100k a year say around £8.75k a month could you make your employer £150k a year as an individual? Clients dont want to pay much for an engineers design (which is wrong) therefore the low wages. How do we change that? Other countries have made it near on impossible to call yourself an engineer, surely the institute of or council of engineers should take on this fight? Now we are in an intriguing possition where we find optical clensing engineers, which are called window cleaners in other countries. The pay for run of the proper qualified engineers is shockingly low compared with other professions. And if you think about you can see why. Other pofessions do not rely on designing and making products for sale. Generally speaking the lower th cost of an item the more it will sell. How are items costs reduced , by keeping the salaries of the engineers as low as possible that they will accept. Doctors , lawyers, solictors , stockbrokers ,politicians, bankers are not reststrained in this way. If a doctor makes a mistake one patient might die, if any of the other professions make a mistake somebody might lose some money , if an engineer in the aerospace industry makes a mistake up to 600 people a time could die. And don’t bother looking to the Imech E for help in increasing engineers salaries in the UK (specially now with Brexit) because the organisation is run by the very same people that profit from low engineers wages . I agree with the last comment that the professional body who represent Civil Engineering do nothing to promote the salaries of Chartered Engineers because it is not in their interest. They also have done nothing to protect the title of Engineer and so anyone and everyone can be called an engineer. undervalued while celebrity and other less important professions such as management consultants are way overvalued. I should add to my last comment that there is only one way to improve the pay and status of true Engineers and that is to build a union to truly represent them such as the BMA for Doctors. After all you don’t get everyone calling themselves a doctor of this or that. I would suggest the British Engineers Association. Their remit would be to get the title Engineer protected in the UK as in Europe and prevent unqualified people doing Engineer’s jobs on the cheap. This is now rife in the industry and truly frustrating for those who have gone to great lengths to become qualified. If anyone has any thoughts I would be interested to hear them. I graduated in Civil in 1999 having been sponsored through Uni by an old and well established contractor. I stuck it out for 2 yrs in London as an engineer but low status and poor pay got the better of me, especially seeing my peers in the city around me. When I resigned the regional director summoned me to their London HQ office to explain, which I did. He was an Oxbridge type, his class mates all earning far more than he, so he said. From there I went into IT and then IT/Finance. It is simply wrong that a CE or any Engineer, is paid at the levels he is. At least from an intellectual requirement and societal utility point of view. The market sets these pay scales and without really very extreme changes in our economic system, they will remain so. CE is an example left-behind middle class profession, they have recently been identified in some papers/research, FT had an article on it a while back. Globalisation is part of it but also more fundamentally the profits for building are not there in comparison to say printing £1Bn of debt over a day and getting £1m in fees eg investment banking. The salary is a function of the profitability in any particular industry. The engineering degree, including civil, is still a very valuable educational attainment. OF course Engineer should be a reserved and protected title, as in any other advanced nation. in Germany/Austria you even get a distinct title! Only in the UK does the Engineer enjoy such extra low status. I employ Engineers in Nuclear on upwards of £600 per day so yes it can be very rewarding. In reply to the question from Kamal, as a retired chartered chemical engineer with 30 plus years of experience, engineering can be a worthwhile, interesting, financially very rewarding career but it is not as easy to achieve as say for a medical career. In general the skills and value of engineers are better recognised and rewarded in capital intensive industries such as utilities or oil and gas rather than lower margin manufacturing where labour costs are critical. I would recommend for study a more general engineering degree such as process/chemical engineering rather than a highly specialised subject to allow for future career flexibility. In my later career as a management consultant advising on corporate strategy I was surprised at the very high proportion of chemical/process engineers in senior management positions given the relatively small proportion of the engineering profession coming from that background. In the UK at the moment, companies recruiting into engineering roles are asking for graduates…. However they don’t care what subject, they’ll state “must have an interest in XYZ engineering”. Why are companies doing this? Firstly because they can pay them peanuts and second because we’ve got graduate managers hiring graduate engineers. When you see a serious engineering role come up, one where experience is essential, it’s usually a temporary or short-term contract. That’s what experienced engineers are, they’re disposable, get them in to sort out the mess and then get rid of them engineers once things are ok again. I have always been surprised how low the pay is reported to be in the UK compared to the US. But as others have mentioned above there are more problems than pay and the all exist here too. US Statistics, Thick lines and bottom are for non-engineer comparison. I think the closest comparison for non engineer here might be for Bachelors degree for men. But, often a BS in Engineering can be 5 years. The press and universities report higher pay than above. I used the graph to look for the mythical engineer shortage creating higher prices. In other words a faster rise than others pay. But, the supply demand curve theory in mytha-nomics might not be correct. I’m retired, ex-UK with B.Sc., C.Eng and have lived in South Africa since 1971. I left the UK two years after graduating having realised that the “engineering profession” offered little security and limited financial upside. In comparison to the UK, South Africa’s engineering profession is highly respected, due in part to the professional engineers registration act. In brief, the award of Pr.Eng. is a highly coveted qualification and accords the holder with the same status and salary range as those attributable to physicians, chartered accountants, etc. The title professional engineer is protected by law and is attained only thru successful completion of a four year accredited university degree in engineering accompanied by three to four years of training/responsible work exposure. No other educational qualifications are deemed appropriate for registration. In contrast , I experienced the opposite during a three month secondment to GEC, UK, midway thru my career. I found that the majority of my colleagues at the GEC office (London) had a variety of qualifications ranging from part completed C&G, to part completed OND, to school leaving certificate with twenty years’ practical experience, to ex-property sales experience, etc. All were designated “engineers” of sorts and all worked in the design and manufacturing offices of GEC. Only the manager was a C.Eng. Interestingly, my Johannesburg employer (i.e. GEC) had to supplement my salary as the UK office paid a much lower rate during my brief sojourn (in the UK)!!! It has also been my experience over the past forty years that there is a constant refrain about the so called shortage of engineers in the UK emanating from the IEE/IET. I can’t believe that this indeed is the case: market forces would have corrected the imbalance by now and engineers would be commanding salaries commensurate with those of other professions. All that’s probably happened is that more part qualified assistant technicians have been hired as engineers at 20,000 pounds per annum. Just read what Wikipedia writes about UK engineer recognition (lack thereof)!! As my wife, a South African who knows absolutely nothing about engineering, says ….. “In the UK, they call anyone an engineer” : therein lies the problem. You don’t learn those things on an engineering degree. You learn about thermodynamics, fluid flow, mechanical calculations etc. If an graduate went into an advanced engineering role those things would be useful. However it seems to me most graduate engineer careers went that advanced. A company hires a degree qualified engineer because they are bright enough not to need much trainig. Speaking as a Broadcast Engineer for a major UK Broadcaster I can say my starting Salary was hilariously low, £20k. The only way to increase is to quit or go into management and cease being an Engineer. Despite the fact that nothing would get fixed if we weren’t there we are grossly undervalued in comparison to the journalistic staff. Trainee Software Engineers get more than me, and fully qualified ones even more so because they are ‘the future’ apparently. Don’t get me wrong I completely understand the worth they bring but ultimately they generally go home at 5pm whereas we provide 24/7 support to keep things on-air and working. I did my ONC, HNC and BSc in Civil Engineering whilst working as an engineering technician. I was aged 28 and a senior technician on 25k pa when I jumped into projects. I initially started as a project engineer on a major UK nuclear site on 32kpa and did this for 3 years. During this 3 years I moved up to 40k pa as Senior PE. I am now 32 and I earn 65kpa plus car and other benefits working as a project manager in the nuclear industry on both decommissioning and new build. My technical background allows me to have an appreciation of the engineering involved. Project management is not about overpromising and under delivering. A good PM will motivate, performance manage and manage stakeholder expectations whilst also managing a projects finances. I am so glad I jumped into projects as it removed from being behind a computer screen all day and has also allowed to live a nice lifestyle in the North of England. There seem to be only two ways to progress financially as an engineer. First, leaving the profession and doing something else for which your engineering skills can be highly valued, think on the financial sector or data science, etc. Second, leaving the UK. I personally took this route after getting tired of seeing how counting beads with an abacus pays twice as much as doing cutting edge research in engineering. Now living in continental Europe and in all honesty it is a much better place for engineers both in terms of pay and recognition. It makes me sad to say this. You are awesome. I totally agree with you. Great engineers in england have become expendable. They come 3 months to clear the shht and then they get fired. It seems design has become a commodity. You do it as cheaply as possible with no care for quality. The salary in engineering is not low but the effort for reward is highly unbalanced. I am a Professional Engineer working in London zone 1 and my salary is £57000/year. For this money, I work normally 11 hours a day under extremely stressful conditions with a lot of responsibility and the only thing I can do when I get back home is to go sleeping. I’m under 35 but the salary doesn’t get higher than that unless you become an Associate/Director where you are not an engineer anymore. The salary can get around £70000 at the director level and this is normally happening after 50 in big corporations and after 40 in smaller companies. My daily job is analyzing information, making high-level decisions and sending and receiving at least 50 emails a day. The level of stress is absolutely incredible. To be clear, I’m doing only 20-30% of my time engineering. Very good Engineers, in general, are contractors and can get around London approx. 32-40£/hr with more than 10 years experience but they always come to repair the mess for 6 months and then get fired. The job as a contractor doesn’t require you to be Chartered Engineer and the pay is higher than as a Permanent Engineer but as a downside, you have to move all over the country and commute huge lengths of time. If you have a wife or a relationship it becomes unsustainable and you’ll soon feel miserable for commuting 3 hours a day. To do the math £57k/year at 11 hours/day of work means 14£/hr Net Pay. Is it good or not? Why is this happening? Because there’s a huge lack of qualified Civil Engineers in England and the remaining good ones are overworked to exhaustion. Also, I know Engineers who just don’t want to work anymore in the industry even after 20 years experience just because the true hourly rate is extremely low. The Civil Engineering industry is not profitable anymore and the companies are still keeping themselves afloat with extreme hours of unpaid work. 2) The UK is no longer at the forefront of engineering anymore. It’s turned into a financial hub. The Engineering institutions (IMECHE, IET etc) haven’t done enough to maintain high standards. The quality of our engineering courses have degraded miserably. So we’ve lost that competitive edge. I think it is worth turning some of these ideas on their heads. Fact is that engineers get paid the correct salary as set by supply and demand on a global basis. Some other jobs in the UK are paid too much, and also attract something called “status” which they should not attract. I’m an mid-career electronics engineer. I get paid £60,000 a year. That’s about the top salary you can get as an electronics engineer. If I worked as a GP I could get paid as much as £104,000 a year. However, I would have been one of the top students in the UK to get into med school and then worked to get a doctorate. If I had a doctorate in engineering I could call myself Dr H. and people would still give me “status” credits – but why? Why do I deserve status? Did Dr Mengele deserve status? Dr Harold Shipman? Now the reality is that GPs shouldn’t get paid £104,000 a year. 99% of the people turning up at doctor’s surgeries have sore throats or measles and the like. They could be treated by a trained nurse on a third of the salary and only sent to a person with a doctorate when the nurse can’t work out what’s wrong. The fact that we pay GPs too much means that they tend to retire early, which means the nation does not get the benefit of the skills they have. Frankly, the medical profession is running a cartel and needs a good shake-up. Others have compared engineers to architects. Well the reality is that most architects don’t get paid very well. The one’s you are thinking of run their own business. You get paid more if you run your own business but there’s a lot of work involved and considerable risk. Then there’s lawyers. But this profession is getting a shake-up right now. Ever since the ending of students grants and replacement with loans, the legal profession has been absolutely flooded with youngsters desperate to get into an apparently well-paid profession. They’ve all seen too many episodes of “Suits”. The legal cartel is trying to protect its high salaries but I don’t think they can hold out forever. Bit by bit prices will drop. I also believe the law is well overdue for a shake up. Why do ordinary people have to pay £20,000 to get divorced? It’s crazy. As for management – well the first rung of management in engineering doesn’t get paid more than I do. I did manage people for a while and it really is a pain in the backside. You also get orders of magnitude more pressure put on you when you are a manager. Managers deserve to get paid more – as long as they’re competent, and quite a few managers I’ve come across have blagged their way into a higher paid job having no idea at all what they are doing and with no training on how to manage people (it’s not like companies like investing in such things). You might say “Well they get paid so much more in the City”. Well they don’t actually. A quant gets paid £72,000 on average. That may seem like a lot more but don’t forget the difference gets taxed at 40% and you’ve probably got either a £9,000 a year season ticket to pay for or an expensive house in the home counties that needs financing. Maybe you want to work abroad? Well I could work in Germany and get paid 15% more in the same job. However, I’d have to work in Munich area and house prices are very high. Most German engineers I know live in apartments, not houses. I could work in the US – I wouldn’t get paid any more but more chances of progression into management would be higher and the cost of very big houses is much lower – note that I wouldn’t be in the lawyer/architect/doctor circles however, and no matter what you might think engineers in Europe or the US do not have the same status as lawyers/doctors/architects. Whether you think a big house in Texas is a worthwhile goal is another matter (Texas, for instance, gets pretty boring after a while, it’s too hot to go outside for 10 months of the year and the relative humidity is 90% so not a great option for many). One thing worth bearing in mind is that many people get stuck in their chosen country when they discover house prices in the UK have risen much faster than in their chosen work country. I think the first problem of being an engineer is that it is a lower middle-class profession. Upper middle-class women do not marry lower-middle class engineers. That likely halves your family income right there, and has knock-on effects. You will likely marry someone who is a teacher or nurse or has a more lowly job. Your net family income will not be that high, one of you will likely give up work to look after the kids as they grow up, because child-care costs make it pointless to stay working. You income will be taxed at up to 40% but you will be earning too much to qualify for in-work benefits. Thus you won’t be much better off than someone on a median salary when all this is taken into account. There are a number of other people in the same wage bracket – supervisors, team leaders, sales managers, used car salesmen, estate agents – and therefore there is a lot of competition for housing in this bracket which means you don’t get much for your money. Your net disposable income will not be sufficient to make substantial investments. You will not be able to afford to help out your kids or send them to independent school. However, if you were a GP you’d likely meet and marry someone also on a high income – very likely another GP. You would have a net income of >£208,000 a year. You would have such a high disposable income you would quickly pay off your mortgage on a big house and then invest in other properties. Your kids would be sent to independent school. By the time you reach 55 you would have so much money you’d be wondering how to spend it. You would likely go into early retirement. However, as I see it the issue is not that the engineer is paid too little – the problem is that the GP is paid too much for the actual job he is doing, which is only moderately skilled, and the current tax/benefits system flattens the income gradient in the £15,000 – £60,000 a year far too much. As for status – you should get status because you are an outstanding person, not because of the job title. Many GPs are lazy incompetent fools who put people’s lives at risk – why do they deserve to be treated as demi-gods? The second problem with being an engineer is it rarely lends itself to setting up your own business. Owning your own business is the way a lot of people with no formal qualifications at all will beat you hollow when it comes to income. Electronics used to be a good way to get into setting up your own business – “Fred in his shed” types coming up with good ideas and turning them into products and services – but the EMC regulations knocked that on the head as the barrier to entry became too great – the government should have provided free EMC testing facilities to ensure that entrepreneurship was not curtailed by the high barrier to entry caused by EMC testing. Software engineering is still a good career if you hope to set up your own business at some point. So my solution to the problems of being an engineer are different to yours. We should tear down the belief that doctors, and solicitors deserve some special status. Criticise them every chance you get. Demand from politicians that the health service is restructured with nurses providing frontline medical services, not people with a doctorate, and divorce, probate and conveyancing is simplified so lawyers can’t coin it in from what should be a smooth simple process for most ordinary people. Demand that barriers to entrepreneurship are removed, simplified and subsidised. Demand that tax and welfare is not socialised at your expense – you are paid more because you deserve more and it is not up to left-wing governments to game the system, buying votes by taxing you and giving the money to people that simply deserve less. Be an awesome citizen because the Laws of Physics beat engineers about the head until they can only think clearly and honestly – which makes them the best people on the planet and it’s time people realised that. If you have a degree in engineering but are only getting paid £25,000 a year mid-career then I’m afraid you probably aren’t working as an engineer but as a technician. Usually this happens either because your degree wasn’t very good or because you made bad career decisions early on which resulted in you ending up in a dead-end. I can only suggest you consider re-training – perhaps outside engineering, because otherwise you will be stuck on this pay grade forever. Grossly uninformed comments regarding GPs. Perhaps you should do some research before posting such comments? A correction Phil H. GPs do not generally hold doctorates, the doctor title they have is a courtesy title. As such when they cease to be practising doctors they should not use the title – not that Dr Fox MP would accept that idea for a moment! I guess this all depends on what you count as engineering – seems like quite a broad range of things to me. My experience is that in technical consulting (for which a good engineering masters degree is a good start) starting salaries are mid twenties to 30k, and you can probably get to 2 or 3 times that over 10-15 years. If you want more you need to contract and you can probably make 50k-150k depending on technical and soft skills. And if you want more you have to employ other people, which can be a lot more rewarding. But as with everything else, reward requires risk. The average starting salary figures are not correct! Look on gradcracker.com and all of the good grad schemes start at £25k. On jobs websites you will see salaries of £18-23k and they are for smaller firms that can’t afford to pay their staff more with little job progression. I briefly worked for a small firm of 20 people and was paid minimum wage with unpaid overtime. I work as a engineer in small consultancy in central london zone 1 and with 2 years graduate experience under my belt. My starting salary was £28k and has progressed to £30k. A chartered engineer gets in the range £35k-40k , that is after 5-6 years experience. With 10 years its around £50-60k. Compared with the big 4 salaries after ACA qualification, starting magic circle law training contracts, investment bank starting salaries, engineering salaries are a complete joke. The low pay of engineering is a fact not a myth in the UK.